For the last five years Bradford has been crowned the curry capital of the UK, so you can imagine my enthusiasm when a curry in Bradford was suggested for the September YTI social. 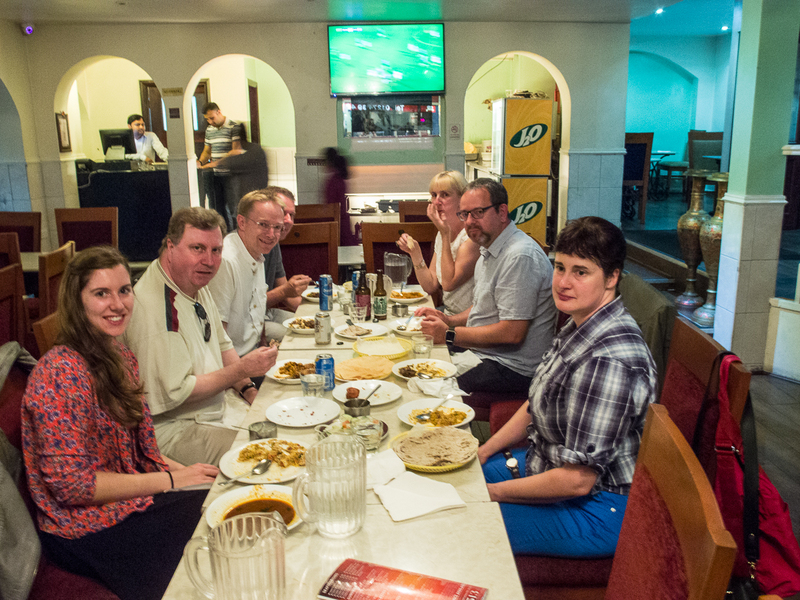 A group of eight of us met at The Kashmir in the centre of Bradford for a delicious meal. We began by sampling a variety of starters including onion bhajis, samosas and fish pakora, and this was rounded off with a selection of authentic curries and chapatti. The evening’s food was accompanied by a range of discussions from the most outrageous translations people have ever faced, to cake decorating, to advice for some new faces to the group (myself included). It was a lovely opportunity to meet others and share tips and stories, as well as some wonderful photos of the views of places from which people translate – our work really can allow us to be in beautiful locations! Thanks to Paul for the photo of us in The Kashmir and, Charlotte for organising, I highly recommend you take a trip there next time you fancy grabbing a curry! Andy Walker, the author of SDL Trados Studio: A Practical Guide and a highly experienced teacher and trainer of SDL Trados Studio, was guest speaker at the J-Net summer workshop held at Leeds University in September. J-Net, the Japanese branch of the ITI, kindly invited members of YTI to attend. This was a godsend for me, a proofreader starting out as a freelance proofreader and translator, toying with the idea of investing in software. My limited previous experience of proofreading in SDL Trados meant I was less than familiar with simple tasks such as creating a Translation Memory (or TM), and was daunted by the jargon. As Andy emphasised at the start of the afternoon session for beginners, the true strength of CAT tools lies in dealing with repetition, whether that be repetition of key terms, or entire sentences. The TM, glossary and autopropagation tools can save hours of work re-translating the same, or importantly a similar, sentence again and again. Having a TM for a client can be a key tool for negotiating repeat orders and can increase their reliance on your services, particularly for similar documents. Clearly, for creative work, translating literature for example, where the idea is to avoid repetition, CAT tools are not necessarily suitable. For my first job after university proofreading patent translations, maintaining the consistency of technical terms was key. I was proofreading on paper, but if I had had access to the glossary, rather than having to make a note in a notebook of each new technical term and how it had been translated, just in case it should crop up again, my work would surely have been more accurate and quicker. My first freelance translation assignment was two owner’s manuals for two almost identical models of speed boat. I realise now that a job of this nature, i.e. long, technical and repetitive, with two separate but very similar documents, is ideal for translation software. Out of the blue, a company I was proofreading freelance for have offered me a full-time role, though using Wordfast, not Trados. My new company are very excited about the new Wordfast Pro 4, though there are still a few bugs to iron out. The interface seems a lot friendlier, and processes are streamlined, for example a project manager sends the linguist a ‘project’, which when opened attaches the TM and glossary automatically, thus saving time. Attending the workshop and the jargon I learned have really helped me transition. Andy Walker was very informative, easy to follow and patient, and I would recommend his book, which is laid out in textbook style with practical exercises, and is available to buy from the publisher Packt: https://www.packtpub.com/hardware-and-creative/sdl-trados-studio-practical-guide. Enormous thanks must go to Megumi Waters of J-Net, who hosted the event and put on a fantastic spread of delicious sandwiches, salads, fruit and cakes for lunch with gallons of tea and coffee. Megumi had convinced the Head of the School of Languages, Cultures and Societies at Leeds University, Dr Matthew Treherne, to come and talk to us and be grilled by attendees on the current state of university language applications. He told us that the current trend leans massively towards students wanting to study more than one language, and also a language with another subject, such as Business or Law, as opposed to studying single honours French, for example. The facilities we used at the university were excellent. Megumi entertained us with a language quiz during lunch, and gave everyone origami to take home. I would recommend attending J-Net’s events in the future if we are invited: they were very welcoming.